Climate: Most of the population lives in a temperate zone with mild seasons, but the country is very diverse climatically, including sub-tropical in the north, desert regions in the center, and polar conditions in the far south. When you hear “Argentina”, many things may come to mind. You may think of Buenos Aires, picture gauchos (skilled horsemen) on the plains herding cattle, or hear a song from Evita! echoing in your head. Argentina is all of those things, but it is also so much more. Most North Americans do not know the breath-taking scope of this South American country. First of all, it is quite large—second in size only to Brazil on the southern continent. It also boasts incredibly diverse climates and geography, ranging from subtropical jungle in the north down to arctic conditions in the south. You have miles of coastline, the towering Andes, desert regions, and some of the most fertile farmlands in the world. With a population of almost 45 million, it is home to modern cities, quaint villages, and everything in between. Here’s a look at just a few of the many faces of this South American wonder. There are an estimated 60,000 expats living in Argentina, and about half live in this dynamic city on the shores of the Rio de la Plata. The city has much to offer an expat. As mentioned, it is a city of immigrants, so new arrivals are always welcome. It is easy to find familiar foods, customs, and people who speak your language. On the other hand, it is also easy to find something new and exciting to do in this vibrant city. Whether you would like to do some shopping in the elegant commercial district of La Recoleta, experience an incredible tango display in San Telmo, soak up the atmosphere in the trendy bars in the Palermo and Las Canitas neighborhoods, enjoy the beauty of Caminito’s colorfully painted houses, or just wander through the Sunday antiques markets, there is always something exciting and intriguing to do in Buenos Aires. If you are a foodie, then Buenos Aires is your dream come true. Because of the mixing cultures, you can find authentic German beer houses, Italians restaurants by the score, Greek delicacies, French pastries—whatever your palette may desire. It is also no secret that Argentinian beef is among the best in the world, so if your idea of the perfect meal is centered around a grilled steak, you have come to the right place. The climate in BA is also very attractive to expats, offering all four seasons, but without extremes of temperature. Summer highs rarely top the mid-80s F, and average lows in the winter are still above freezing. Are you just not a city person? Argentina still has much to choose from. Consider the city of Mendoza, located in the foothills and high plains in the north-central part of Argentina. Mendoza is famous for its production of olive oil and some of the world’s best wines. 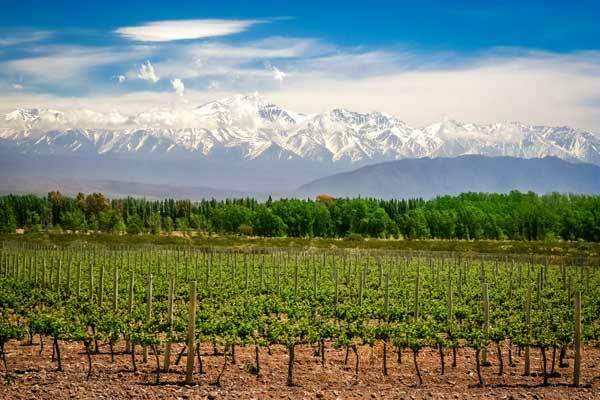 In fact, Mendoza is on the list of the nine “Great Wine Capitals”, with the Malbec wines leading the way. Recently, enotourism (touring for the purpose of tasting wines) has become a growing business concern, with Mendoza serving as a base for exploring the Argentina Wine Route, or Ruta del Vino. Downtown Mendoza is home to about 125,000, with the greater metropolitan region claiming about a million souls, so it is small enough to feel comfortable, but big enough to provide all of the infrastructure support. The downtown area is very modern, and its location on the main road between Buenos Aires and Santiago in Chile also contributes to the strong economy. If you are an expat who loves the outdoor life, a great place to settle is in San Carlos de Bariloche, on the southern shores of the Nahuel Huapi Lake. The name comes from the Puyo people’s name “Vuriloche”, which in their language means “people from behind the mountain”. The natives used to access the village through a narrow mountain pass, keeping it hidden from the Spaniards for many years. Major civic improvements between 1930 and 1950 transformed this sleepy little mountain town into a vacation spot for wealthy Argentinians and Europeans. A strong German and Swiss presence is still seen in the architecture, with some sections resembling an alpine village. Bariloche is now a popular destination for ski enthusiasts in the winter (June to September, as the seasons are reversed below the equator), and the lake’s beach is full of sunbathers during the summer. Mountain biking, fishing, white water rafting, and bird watching have also become very popular in Bariloche, and it is a great place to use as a base to explore the Patagonia region. You say Buenos Aires is too big, and Mendoza is too small? In that case Goldilocks, you may find that this city to be “just right”. Córdoba is the second largest city in Argentina with a population pushing 1.5 million. It is located in the center of the country, about 435 miles northwest of the capital. The climate is similar to Buenos Aires, but it can get both hotter in the summer and colder in the winter. Although a manufacturing center—Renault, Fiat, Nissan, Mercedes-Benz, and Volkswagen all have plants there—Córdoba has long been associated with education and culture as well. There are six major universities and several post-secondary schools. 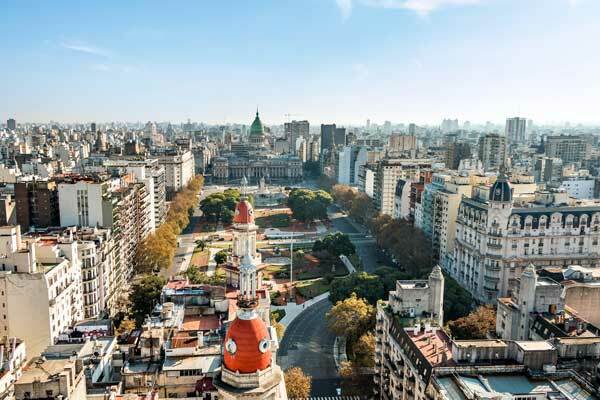 Although one of the oldest cities on the continent, the influx of students from all over Argentina, South America, and even Europe, gives this city a young, cosmopolitan flavor. Not surprisingly, Córdoba has also become the center for technological advancement in Argentina. Motorola and Intel are major employers, and the Argentinian space effort has a spaceport where satellites are developed and tested. Another feature expats find attractive about Córdoba is its central location. From here it is easy to take day trips to the pampas where you can ride like a gaucho, or join an excursion into the Andes for some trekking. North of town is La Cumbre, a popular place for hang gliding, parasailing, and skydiving. Villa General Belgrano is another interesting day or weekend trip. This small village is where 130 survivors of a scuttled German battleship settled, and it now resembles a full German village—complete with breweries, leberwurtz, späztle, and the third largest Oktoberfest in the world. Argentina has an eclectic mix of native South American, European, and Asian cultures that guarantees a little something for everyone. It is easy to feel at home no matter your country of birth. The people, even in the large cities, are friendly and welcoming. Oddly, in a country with so many immigrants, getting residency can be a daunting task. Rules and requirements seem to change frequently, so it is a good idea to check with the Argentinian Consulate for the latest information. Most North/South American and Europeans can enter Argentina and stay for 90 days on a valid passport. In fact, some people living there now take advantage of a special feature of Argentina’s law. Unlike most countries, if you leave Argentina for just one day, the calendar resets: you can then re-enter on your passport and stay another 90 days. Argentina has a lot to offer and a wide range of climates. That’s because it is so big. Although there are good road and rail systems, travel from one city to another can still mean 12 to 20 hours on a bus or train. Fortunately, there are many smaller airports, and fares between regions are reasonable. The museums and theaters of Buenos Aires, Mendoza, and Córdoba are among the best in the world. Just walking the La Recoleta cemetery in BA is a cultural feast. Additionally, the rich mix of architectural styles; the blend of culinary and musical arts from different cultures, and the rich history found even in the smallest of towns is enough to satisfy the most demanding connoisseurs of the arts. Argentina, like much of Central and South America, has had more than its share of ups and downs when it comes to politics and economics. At one time, Argentina had one of the strongest economies in the world, but it has been struggling since WWII. Although there has been progress in both of these areas in the past few years, protests in the square in front of Casa Rosada in the capital are still common. Read More : Why Argentina?